Ken Watanabe (渡辺 謙, Watanabe Ken, born October 21, 1959) is a Japanese actor. To English-speaking audiences, he is known for playing tragic hero characters, such as General Tadamichi Kuribayashi in Letters from Iwo Jima and Lord Katsumoto Moritsugu in The Last Samurai, for which he was nominated for the Academy Award for Best Supporting Actor. Among other awards, he has won the Japan Academy Prize for Best Actor twice, in 2007 for Memories of Tomorrow and in 2010 for Shizumanu Taiyō. He is also known for his roles in Christopher Nolan's films Batman Begins and Inception. In 2014, he starred in the reboot of Godzilla as Dr. Ishiro Serizawa, and will reprise his role in the sequel, Godzilla: King of the Monsters. He lent his voice to the fourth and fifth installments of the Transformers franchise respectively, Transformers: Age of Extinction and Transformers: The Last Knight, as Decepticon turned Autobot Drift. He made his Broadway debut in April 2015 in Lincoln Center Theater's revival production of The King and I in the title role. In 2015, Watanabe received his first Tony Award nomination for Best Performance by a Leading Actor in a Musical at the 69th Tony Awards for his role as The King. He is the first Japanese actor to be nominated in this category. Watanabe reprised his role at the London Palladium in June 2018. Watanabe was born in Koide, Niigata. His mother was a school teacher and his father taught calligraphy. Due to a number of relocations for his parents' work, he spent his childhood in the villages of Irihirose and Sumon, both now part of the city of Uonuma, and in Takada, now part of the city of Jōetsu. He attended Niigata Prefectural Koide High School [ja], where he was a member of the concert band club, playing trumpet, which he had played since childhood. After graduation from high school, in 1978 he aimed to enter Musashino Academia Musicae, a conservatory in Tokyo. However, he had never received a formal musical education, and because his father had collapsed when he was in junior high school and was unable to work, there was difficulty in finding the money for tuition. Because of these problems, Watanabe gave up trying to enter the conservatory. After graduating from high school in 1978, Watanabe moved to Tokyo to begin his acting career, getting his big break with the Tokyo-based theater troupe En. While with the troupe, he was cast as the hero in the play Shimodani Mannencho Monogatari, under Yukio Ninagawa's direction. The role attracted critical and popular notice. In 1982, he made his first TV appearance in Michinaru Hanran (Unknown Rebellion), and his first appearance on TV as a samurai in Mibu no koiuta. He made his feature-film debut in 1984 with MacArthur's Children. Watanabe is mostly known in Japan for playing samurai, as in the 1987 Dokuganryu Masamune (One eyed dragon, Masamune) the 50-episode NHK taiga drama. He played the lead character, Matsudaira Kurō, in the television jidaigeki Gokenin Zankurō, which ran for several seasons. He has gone on to garner acclaim in such historical dramas as Oda Nobunaga, Chūshingura, and the movie Bakumatsu Junjo Den. In 1989, while filming Haruki Kadokawa's Heaven and Earth, Watanabe was diagnosed with acute myelogenous leukemia. He returned to acting while simultaneously undergoing chemotherapy treatments, but in 1991 suffered a relapse. As his health improved his career picked back up. He co-starred with Kōji Yakusho in the 1998 Kizuna, for which he was nominated for the Japanese Academy Award for Best Supporting Actor. In 2002, he quit the En (Engeki-Shudan En) theatre group where he had his start and joined the K-Dash agency. The film Sennen no Koi (Thousand-year Love, based on The Tale of Genji) earned him another Japanese Academy Award nomination. In 2006, he won Best Lead Actor at the Japanese Academy Awards for his role in Memories of Tomorrow (Ashita no Kioku), in which he played a patient with Alzheimer's Disease. Watanabe was introduced to most Western audiences in the 2003 American film The Last Samurai, set in 19th Century Japan. His performance as Lord Katsumoto earned him an Academy Award nomination for Best Supporting Actor. Watanabe appeared in the 2005 film Memoirs of a Geisha, playing Chairman Iwamura. That same year, he also played Ra's al Ghul's decoy in Christopher Nolan's Batman film reboot, Batman Begins. In 2006, he starred in Clint Eastwood's Letters from Iwo Jima, playing Tadamichi Kuribayashi. He has voiced Ra's al Ghul's decoy in the Batman Begins video game. He has filmed advertisements for American Express, Yakult, Canon and NTT DoCoMo. In 2004, he was featured in People Magazine 's 50 Most Beautiful People edition. In 2009, he appeared in The Vampire's Assistant. 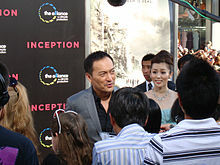 In 2010, he co-starred in Inception, where he stars as Saito, a mark-turned-benefactor businessman of the film's heist team. In 2014, he starred in the Hollywood blockbusters Godzilla and Transformers: Age of Extinction. In 1983, Watanabe married his first wife, Yumiko. In September 2005, following two years of arbitration, he and Yumiko were divorced. He got to know Kaho Minami when they were acting together in a suspense drama for TV Tokyo. Around the time of his divorce the two began seriously dating, and were married on December 3 of the same year. Their marriage was announced by their agencies on 7 December, just after they had attended a New York City premiere of his film Sayuri together. Watanabe formally adopted Minami's son from her previous marriage to director Jinsei Tsuji, and for a time the three of them lived in Los Angeles. In order to increase the amount of time the family could spend together, considering Ken's work requiring him to travel so much, they later returned to Japan. Initially Minami and Ken did not hold any wedding ceremony, but in 2010 they announced that they had held a ceremony on August 1 in Los Angeles. Watanabe has two biological children and an adopted son. His oldest son, Dai Watanabe (born 1984), is an actor, and his daughter Anne Watanabe (born 1986) is also an actress and fashion model. In August 2008, Dai had his first child, a son, making Ken a grandfather at the age of 48. A granddaughter was born to Dai in March 2010. In 1989 Watanabe was diagnosed with acute myeloid leukemia. The cancer returned in 1994, but he later recovered. In 2006 Watanabe revealed in his autobiography Dare? - Who Am I? that he has hepatitis C. At a press conference held May 23, 2006 in Tokyo's Ginza district, he said he was in good condition but was still undergoing treatment. On February 9, 2016, it was revealed Watanabe had been diagnosed with stomach cancer and would postpone scheduled performances to undergo necessary treatment. In May 2016, Watanabe's daughter by his first marriage, Anne, gave birth to twin girls, and in November 2017 she gave birth to a son, giving Ken Watanabe five grandchildren altogether. On May 17, 2018, Kaho Minami's agency announced that Minami and Watanabe had divorced after he had admitted having an extramarital affair. ^ "Ken Watanabe Receives 2015 Tony Nomination for "The King and I"". crunchyroll.com. April 29, 2015. ^ Longman, Will. "Details confirmed for The King and I at the London Palladium in 2018". LondonTheatre.co.uk. Retrieved November 17, 2017. ^ "The King and I". londonboxoffice.co.uk. Retrieved November 17, 2017. ^ Keck, William (February 24, 2004). "Japanese Cruise". USA Today. Retrieved May 7, 2010. ^ Rebecca Murray. "The Last Samurai - Ken Watanabe and Shin Koyamada Interviews". About.com Entertainment. Retrieved January 28, 2016. ^ Corkill, Edan. "From Hollywood to Hirohito". The Japan Times. Retrieved February 19, 2014. ^ "Watanabe nominated for Academy Award". Archived from the original on February 14, 2012. Retrieved February 12, 2012. ^ Justin Kroll. "John Goodman, Ken Watanabe to Voice Autobots in 'Transformers: Age of Extinction'". Variety. Retrieved January 28, 2016. ^ a b "Actors Watanabe, Minami tie knot". The Japan Times. The Japan Times Limited. December 8, 2005. Retrieved May 18, 2018. ^ ""Memoirs of a Geisha" New York City Premiere - Inside Arrivals". Getty Images. December 6, 2005. Retrieved May 18, 2018. ^ "Ken Watanabe to appear in Docomo ad with Darth Vader". Japan Today. GPlus Media Inc. September 2, 2010. Retrieved May 21, 2018. ^ Freydkin, Donna. "Watanabe opens 'a box of painful memories'". USA Today. Retrieved February 10, 2016. ^ "May - 2006 - Japan Zone". Retrieved January 28, 2016. ^ "kizuna311". YouTube. Retrieved April 12, 2012. ^ ""kizuna311" a message from Ken Watanabe". YouTube. Retrieved April 12, 2012. ^ "Kizuna – Unity and Hope.Together we will prevail and overcome". Kizuna311.com. Archived from the original on March 28, 2012. Retrieved April 12, 2012. ^ "Ken Watanabe of 'Last Samurai' fame divorces his actress wife". The Asahi Shimbun. The Asahi Shimbun Company. May 19, 2018. Retrieved May 19, 2018. ^ "Ken Watanabe and Kaho Minami divorce after cheating scandal". Arama!. May 19, 2018. Retrieved May 19, 2018. ^ a b c d e f g h i j k l m n o "Awards for Ken Watanabe". IMDB. Retrieved March 7, 2010. ^ "Drama Academy Awards". Tokyograph. Archived from the original on January 29, 2010. Retrieved March 7, 2010. ^ "Blue Ribbon Awards: 'Hula Girl' Aoi on top". Tokyograph. January 24, 2009. Retrieved March 7, 2010. ^ "Another win for 'Hula Girl' at Japan Academy Awards". Tokyograph. February 16, 2007. Retrieved March 7, 2010. ^ "TBS producer wins Fujimoto Prize". Tokyograph. June 8, 2007. Retrieved March 7, 2010. ^ "Kinema Junpo announces Best 10". Tokyograph. January 9, 2007. Retrieved March 7, 2010. ^ "34th Hochi Film Awards". Tokyograph. November 28, 2009. Retrieved March 7, 2010. ^ "33rd Japan Academy Awards". Tokyograph. March 6, 2010. Retrieved March 7, 2010. ^ "58th Annual GRAMMY Awards Nominees". The GRAMMYs. Archived from the original on December 7, 2014. Retrieved January 28, 2016. 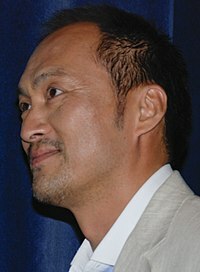 Wikimedia Commons has media related to Ken Watanabe.